Somia El-Rowmeim was seated at a folding table at An-Noor, an adult day care center and community space in Bay Ridge, Brooklyn, coaching a small group of women through the basic principles of phone-banking. Inside the long, narrow building, an ensemble of parakeets prattled away in a cage near the door; an elderly man paged through a newspaper and picked at his soup. It was just over a week before Election Day, and the volunteers—which included immigrants from Egypt, Syria, Morocco, and Yemen (where El-Rowmeim grew up)—listened attentively as she walked them through a script of Arabic-language campaign talking points for Democratic candidates Max Rose and Andrew Gounardes, who were challenging incumbent Republicans in Congress and the state Senate. When it was over, the women split into pairs and practiced their lines. El-Rowmeim is a full-time community organizer. She runs a women’s assistance program at the Arab-American Association of New York, which offers self-defense courses and literacy classes and teaches women how to deal with the police if they’ve been the victim of a hate crime, among other services. But for the last few months, she’d spent her free time working with small groups of women, in an effort to mobilize the largest Arab American community on the East Coast into something it hadn’t been before—a political force. New York City may be a bastion of Democratic politics, but Bay Ridge has long been dominated by Republicans. On Tuesday, that changed in a big way. Rose, an Army veteran, knocked off Republican Rep. Dan Donovan in one of the night’s biggest upsets, winning a congressional district that also includes the Trump stronghold of Staten Island. And in the state Senate, Gounardes is currently leading 16-year incumbent Marty Golden, though Golden has yet to concede. The strong performances by Rose and Gounardes were in no small part the product of organizers like El-Rowmeim and the network of Muslim women, immigrant activists, and allied groups who contacted tens of thousands of voters and worked for more than a year to expand the electorate in Bay Ridge. That effort was born out of a new sense of urgency in a community that has been devastated by the Trump administration’s travel ban and a rise in Islamophobia. Over the last two years, Muslims and Arab Americans in Brooklyn have led mass protests, registered to vote in record numbers, and launched new organizations and campaigns to try to leave their mark on the political process. Arab Americans and Muslims in Bay Ridge have endured scorn and suspicion from politicians and public officials for years. After 9/11, the community was the subject of a massive, decadelong NYPD surveillance program, in which undercover officers infiltrated mosques and wrote reports on newsstands and halal shops, ostensibly to combat terrorism. The ban tore Brooklyn families apart overnight. Husbands were separated from their wives, parents were separated from their children, brothers were separated from their sisters. Almost every organizer I spoke with in Bay Ridge was affected in some way. El-Rowmeim’s siblings in Yemen are now unable to visit her or her mother in the United States—which means that if her mother wants to see her grandchildren, she has to enter a war zone. Rabyaah Althaibani, another Bay Ridge community activist who’d been volunteering for Gounardes and Rose, was separated from her husband for a year after the ban went in place. A journalist in their native Yemen, he’d fled the country—to Malaysia—because of the dangers reporters face there. But he was left stranded when the ban went into place. He finally received a waiver this spring. Though the ban was a federal crisis, not a state issue, Golden wasn’t much help either. Asked about the ban in an interview shortly after it was announced, Golden defended it, alleging that some of the 9/11 hijackers had lived in Bay Ridge prior to the attack. That was false and, to community members, deeply insulting. Though he later apologized, his answer came up over and over in my conversations with activists. Bay Ridge residents dealt with the shock of the ban and the new administration through an unprecedented level of political organizing. On the second night of the ban, Yemeni-American cab drivers went on strike. Inspired by that mass demonstration, a few days later hundreds of Yemeni shopkeepers around the city locked their doors and organized their own walkout—the Bodega Strike. From a national perspective, it may have registered as little more than a blip at a moment of national protests. But for Yemenis and other affected groups in Brooklyn, it felt like an awakening; it was a historic mass demonstration undertaken at considerable sacrifice. In the following months, many of those affected by the ban threw themselves into politics. A newly formed group of Yemeni businessmen launched a voter registration drive. 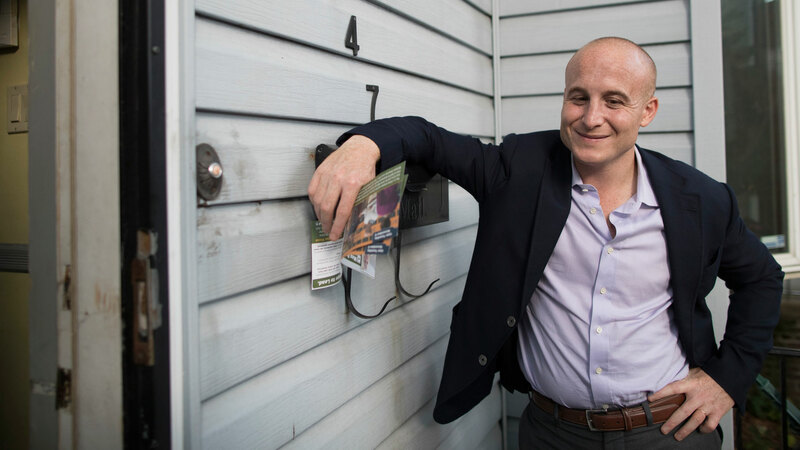 And in Bay Ridge, El-Rowmeim and others began volunteering for a city council candidate, Khader El-Yateem, a Lutheran pastor of Palestinian descent. In the aftermath of El-Yateem’s race, El-Rowmeim and other organizers formed a group called Yalla Brooklyn—Yalla means “let’s go!” in Arabic—to continue the work of political engagement, and they jumped headfirst into the 2018 elections. Golden may have ignored them, but Gounardes made time. After a Muslim woman was verbally harassed while riding a bus in Bay Ridge, Gounardes’ campaign held a training on bystander intervention—to teach community members how to step in if they witness discrimination. The women El-Rowmeim trained also had to get their own houses in order. In addition to the traditional canvassing and phone-banking “turf” familiar to any campaign, they each built their own personal lists of family members and neighbors who were registered to vote. Each woman was responsible for keeping tabs on 50 people to make sure they showed up. The election was always about several different things at once. The Arab American community in Bay Ridge was voting on basic issues, such as good schools, health care, and security for their families—Trump rarely came up in their conversations with voters. But by organizing and voting, they wanted to become influential enough that elected officials and candidates had to take notice—“so [that] anyone who is gonna think about running for election, they have to reach out to us to seek our help, and also they have to ask what kind of support and help we need,” El-Rowmeim said. It would be too simplistic to say that Donovan, and potentially Golden, lost because of the Muslim ban. They faced well-funded, credible challengers, and encountered a wall of opposition that went well beyond the Yemeni and Syrian communities. But by supporting a policy that devastated families in their districts, the Republican incumbents steered straight into a headwind. The ban was a constant presence in the lives of many of the organizers who took them on, and it lent a sense of urgency to their efforts to engage their communities in the democratic process. The returns on Election Day showed a sea of dark blue in the precincts organized by Arab and Muslim activists—and that, in turn, proved critical to Democrats’ success. El-Rowmeim was one particularly influential organizer, but there were many. The New York State Immigrant Action Fund, the independent-expenditure arm of the nonprofit New York Immigration Coalition, was a driving force in the get-out-the-vote efforts over the last six weeks. From their base camp in Brooklyn, hundreds of volunteers—including Arab and Muslim community members and activists from progressive Jewish groups—knocked on more than 18,000 doors, made more than 30,000 phone calls, and sent out nearly 15,000 postcards to voters on the north shore of Staten Island and in Bay Ridge. NYSIAF focused exclusively on voters of color—Middle Eastern, South Asian, Hispanic, and African immigrant communities—who were either newly registered or who hadn’t turned out in any of the last four elections. Candidates “don’t have the time or don’t want to contact these individuals, because they believe it’s too much of an investment—that they can be contacting four or five other voters for the amount of time they have to spend on one voter,” said Murad Awawdeh, NYSIAF’s political director. Golden himself had written off the community as a voting bloc. Even as his constituents were scrambling to fight back against the travel ban, he told a local civic advocate that “Palestinian and Arab communities” don’t vote. But the community organizers in Bay Ridge were willing to put in the work, and it paid off. On Election Day, El-Rowmeim was in constant motion. At 7 a.m., she got a call saying a polling location at a local school needed an Arabic translator—a good sign, she thought; it meant her community was showing up. After her first shift offering language assistance at one precinct, she got called out to another, and then another. When she and her volunteers weren’t doing that, they were handing out fliers in Bay Ridge, working the phones, and knocking on doors until 6 p.m. When someone needed a ride, they called El-Rowmeim. When someone had a question about where to vote, they called El-Rowmeim. When someone was having second thoughts about leaving their house in the rain, El-Rowmeim called them. At an election night party for Gounardes, she fielded nervous texts from friends and family as the returns showed a tight race. Around 10:15 p.m., the congressional race was called, and not long after that, Gounardes declared victory. The voters of Bay Ridge had done what their state senator said they wouldn’t. “We showed him our community is powerful,” she said.